MAY 20th will mark the end of “mental-health awareness week”, a campaign run by the Mental Health Foundation, a British charity. Roughly a quarter of British adults have been diagnosed at some point with a psychiatric disorder, costing the economy an estimated 4.5% of GDP per year. Such illnesses have many causes, but a growing body of research demonstrates that in young people they are linked with heavy consumption of social media. 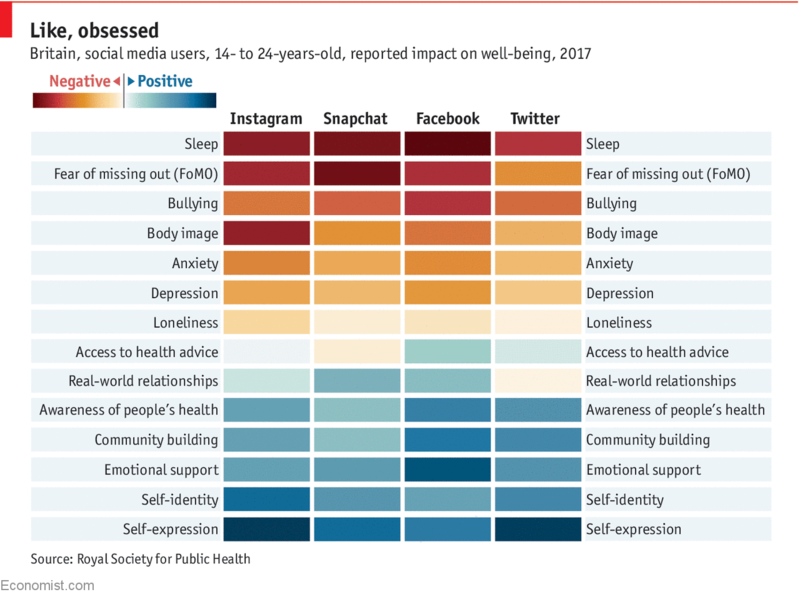 According to a survey in 2017 by the Royal Society for Public Health, Britons aged 14-24 believe that Facebook, Instagram, Snapchat and Twitter have detrimental effects on their wellbeing. 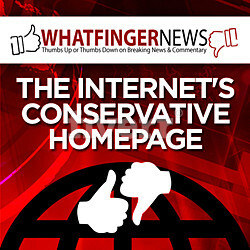 On average, they reported that these social networks gave them extra scope for self-expression and community-building. But they also said that the platforms exacerbated anxiety and depression, deprived them of sleep, exposed them to bullying and created worries about their body image and “FOMO” (“fear of missing out”). Academic studies have found that these problems tend to be particularly severe among frequent users. Sean Parker, Facebook’s founding president, has admitted that the product works by “exploiting a vulnerability in human psychology”. Indeed, an experiment by five neuroscientists in 2014 concluded that Facebook triggers the same impulsive part of the brain as gambling and substance abuse. Yet it is difficult to prove that obsessing over likes and comments causes mental illness, rather than the other way around. The most convincing effort was a survey that tracked a group of 5,208 Americans between 2013 and 2015. It found that an increase in Facebook activity was associated with a future decrease in reported mental health. An obvious solution to the problem is to cut down on screen time. Even the most obsessive users should be able to do so. The neuroscientific study on Facebook found that the subjects’ cognitive ability to inhibit their impulsive behaviour was less impaired than for drug or gambling addicts. And data from Moment, an activity-tracking app, show that it is possible for light social-media consumers to be content. 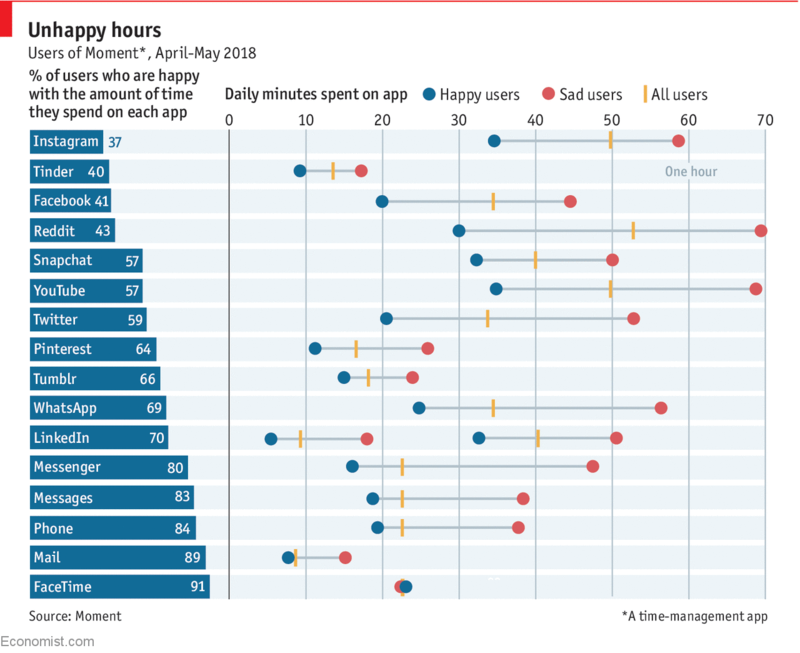 Each week it asks its 1m users whether they are happy or sad with the amount of time they have spent on various platforms. Nearly 63% of Instagram users report being miserable, a higher share than for any other social network. They spend an average of nearly an hour per day on the app. The 37% who are happy spend on average just over half as long. The happiness rate is much higher for FaceTime (91%), a video-calling app, and phone calls (84%). When it comes to social networking, actual conversations are hard to beat.